#43 87 on 26:05:2006 + Pla's 25th. 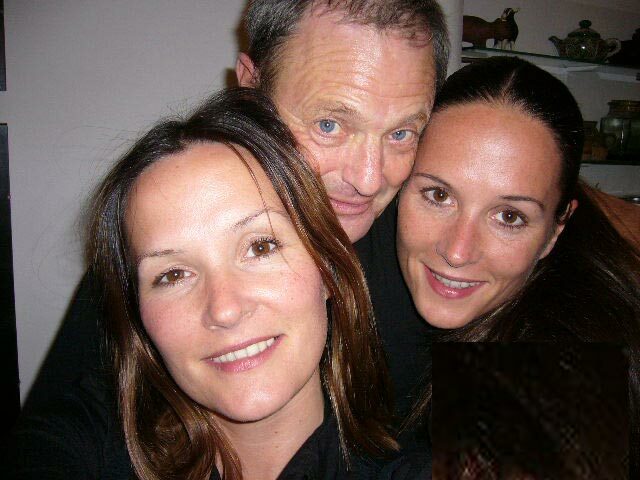 We went to lunch with Sally's sister, Judy, and their dad, Arthur. It was his 87th birthday. ¡cumpleaños feliz! In the evening Sally and I went to our friends Eduardo and Marlise Pla's 25th wedding anniversary bash. 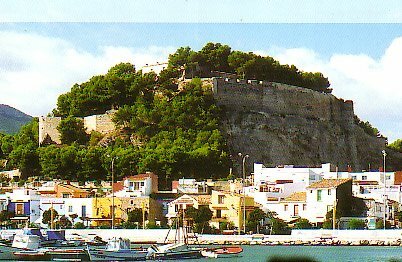 With 50 other guests we dined on tapas, then all sorts of sea foods (see a selection on my plate - lobster, crab claws, razors, huge oysters tasting of the sea and big red Denia prawns). 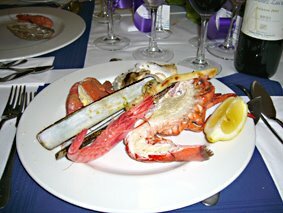 Then a main fish course, sorbet and after that 'wedding' cake and champers. After that, Marlise sang a song to her husband and then a group came on and played. We got home some time the next day.
. . . be able to log-on to my menfot blog to remind myself where I live and then find my way home! Good aye? 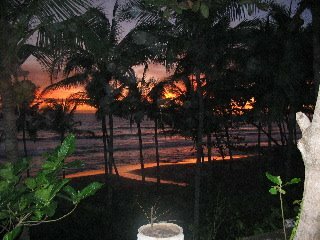 I just found this sunset picture taken at Snowy's place in Bali. I also replaced the picture from #10 Bali Week One (see below - a long way down) of Sally & Jenny with the kids gamelan band, with a better one and a Duran Duran picture on post #12 . . . .
After last nights sub-triumph (see below) I was very stupid and went to Gata, a local village, and sort of ran their evening 9k running race. (thinks) I'll have a day off tomorrow. Hurray! 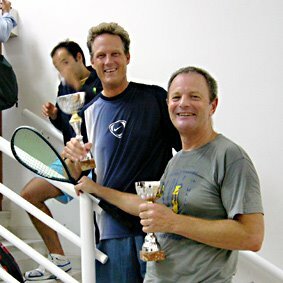 Ladies and Gentleman, I am now the Subcampeon Ogisaka Squash Tourneo Mayo 2006 (and I've got the cup to prove it!). 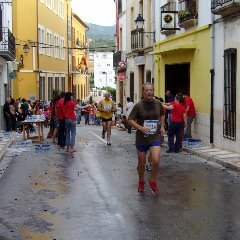 Our friend Arturo (see last post) organised the event and 16 people entered. A big range of styles and experience and I was very lucky to come up against lads with not so much experience. The semi final was fun, an Argentinean called Mariano could hit the ball at 100 mph but didn't have much tactics, so I scraped through. The final was a bit of a foregone conclusion as Kevin is head and shoulders above me (technically and physically) but I got a few points, so that was all right. 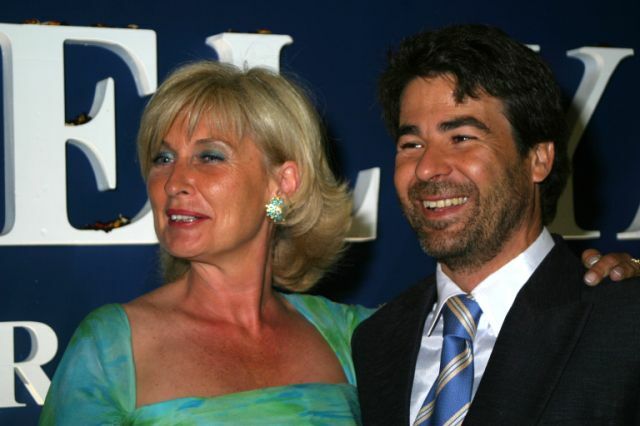 Chelo Perez Fernandez y Arturo Gonzàlez Luis. Once a week I meet up with Chelo and we have a glass of wine and chat in English and Spanish. 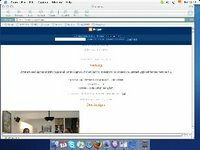 Its called an intercambio and the idea is that we correct each others gramatical errors. 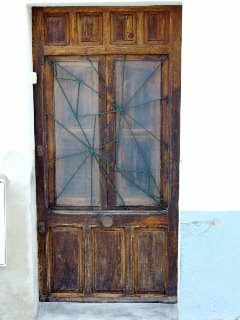 Seems to work OK, don´t it? Arturo is the boss-man at the gym, he is putting me through a weight lifting programme which makes my muscles ache. I may have to change my diet to egg whites, whey proteins, human growth hormones and boiled chicken . . . . or maybe I´ll just stick to the rioja . . . . . . I met my wife at Heathrow Airport (Terminal One Departures). Well not originally, it was Monday morning to be exact. Anyway, she has just completed her tour of the world having been to; Thailand, Bali, Australia, New Zealand, Fiji, America, Mexico, Canada, England and finally back to Spain. I went to London for the weekend and we came back to Spain on the same flight. 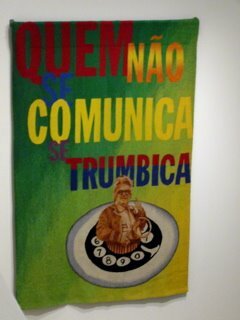 We had trip to the Barbican Centre in London to see an exhibition called "Tropicáli - a Revolution in Brazilian Culture". 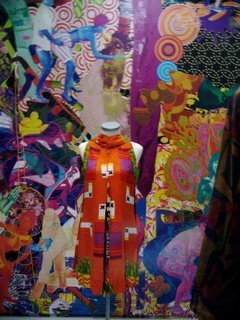 Mostly graphics and clothes from the sixties and some "installation" the best being a huge tv wall screen showing camp Brazilian music videos. The top picture translates to "Those who don't comunicate get left behind" - quite apt for a blog, don't you think? By the way, if you look carefully at the couple (top left of the picture) playing wheelbarrows, its not what you think, its just the way they dance in Brazil (apparently). 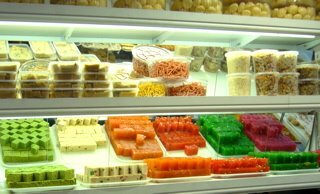 Violent green pistachio, fluorescent orange ghulb jamen, double cream almond, purple red 'some other kind of sweet' all on display in one of Tooting's many Asian sweet shops. 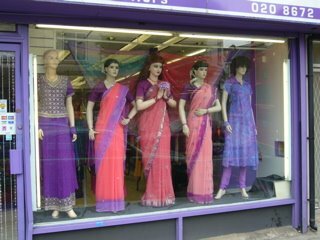 Squid purple, hungover pink and deep-vein-thrombosis blue coloured sarees gracing another Tooting shop window. 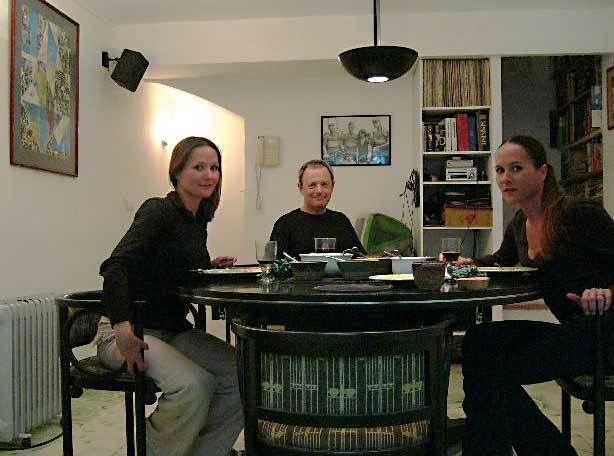 Here I am in London, staying with Jay & Mascha. This morning I went for a run round Tooting Bec Lido. Near the end of the run I started to get (even more) tired so I began to walk. Coming towards me was a youngish woman and as we passed she said, in a big London accent, "A'int you supposed to be running?" I replied "I know" with a laugh. Then blow me, not a couple of minutes later, another woman is sort of jogging from her car towards me and she says, with a grin "I used to be able to run once!" to which I said "So could I !" 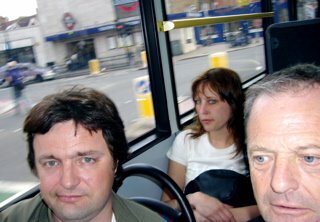 Later we went on a bus. 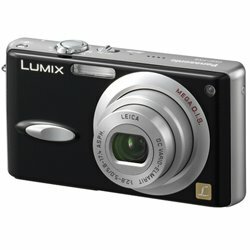 I got this Panasonic DMC-FX8K Lumix® 5 Megapixel Digital Camera with 3x Optical Zoom & MEGA Optical Image Stabilizer for my birthday. Lucky me! I used it for all the pics between here and the toothpaste . . . .
. . . . which reminds me. Please send me a comment or e.mail if its not as it should be. A convivial evening with friends, Charlotte & Annie. We ate curry (see below) and drank fine wine (not shown). And played with my new Lumix camera in 'self portrait' mode. 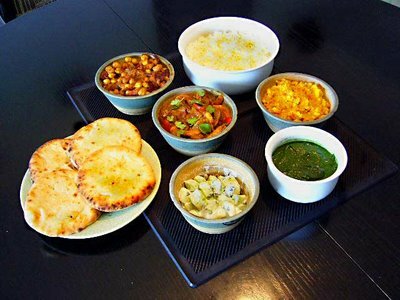 Big bowl of Basmati rice, Tarka Dhal (Yellow Lentils), Sag Dhal (Spinach & Ginger), Raita (Cucumber in minty yogurt), Nan Bread (from the shop), Channa Dhal (Chic Peas), in the middle Hot & Sour prawns (Hot & Sour prawns). . . . enough for three?. . . I hope so.